As Lane's legend and fame increase, so does the amount of pressure he puts on himself, to be what everyone wants him to be, and he wants to show that he is as good as they say he is. His ascent to the world championship is marred by a cheating incident, questions about Kellie's devotion, and a near broken neck. The film also follows him through the true life series between himself and Red Rock, a bull that no cowboy had ever been able to stay on for 8 seconds. It cuts the series down to three rides. In 1989, he is the second-to-last rider at the Cheyenne Frontier Days Rodeo. While riding on the bull known as "Takin' Care Of Business", he dismounts after his 8-second ride but the bull turns back and hits him in the side with his horn, breaking some ribs and severing a main artery. As a result of excessive internal bleeding, he dies on the arena floor before he can be transported to the hospital. Filming took place in mainly in Boerne, Texas, Del Rio, Texas, Tucson Rodeo Grounds, and Pendleton, Oregon and a handful of other minor locations. The film gained a mixed reception. The Milwaukee Journal praised Perry's acting but criticized the performance of Cynthia Geary, who played Kellie Frost. It holds a 33% rating from Rotten Tomatoes. 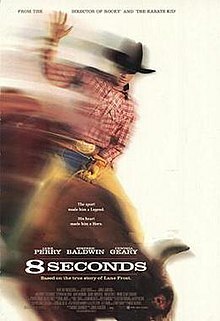 ^ "8 Seconds". Turner Classic Movies. United States: Turner Broadcasting System. Retrieved March 31, 2018. ^ "Review/Film; Finally Riding a Rodeo Bull Off Into the Sunset". The New York Times. Retrieved 2012-06-01. This page was last edited on 7 March 2019, at 18:40 (UTC).